Chocolate! One of the most popular foods in the world. But how much do you really know about the mighty cacao bean, its benefits, and how to use it? Cacao Theobroma is a fascinating plant, one that continues to reveal more mysteries the longer you study it. 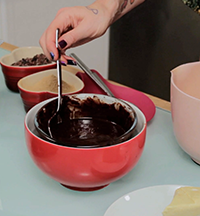 The video is accompanied by a PDF which details the main points of the video, and also includes the chocolate recipe. Watch at home or on the go. Raw Magic Academy videos will work on all your devices. I can wholeheartedly recommend her wonderful teaching – entertaining and enlightening, highly informative and for some, pretty mind blowing, Kate’s knowledge is truly remarkable. I am focusing on everything i am grateful for at the moment, and i just want to tell you how you have totally changed my world with your recipes and writings. My diet is now approx 75% raw…this is down to your inspiration, I am happy with that, it works well for me. But it’s not just my life you have touched, because i have learnt so much from you, I can share what i have learnt….nearly all the women in my life now take Maca every day, because of you !! And what I have learnt from you and can now confidently share, this is one small way in which you have reached out to people beyond your sight. I always make something from Raw Magic when I have friends round, or go to a bring and share meal. Keep up the good work, you are amazing.